I came across a cool, free utility the other day while I was searching for ways to get video prepared for my Zune (which I’ll review at a later date). The utility is simply called “Free YouTube to iPod Converter”. The utility was developed by DVDVideoSoft and it is extremely useful. Basically, the software was designed with one purpose in mind, and it does that very well. It converts Flash Video files to video that’s compatible with your mobile devices. 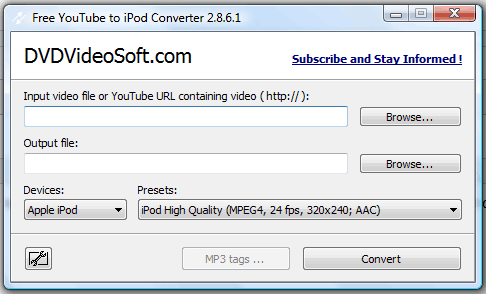 It’s main purpose is to convert YouTube videos to the iPod mp4 video format, but it does do a few other things, too. First of all, not only can it convert FLV files from your hard drive into mp4 video files, it is also capable of extracting an FLV directly from YouTube. All you do is plug in the URL for the video you want to convert, and the utility accesses YouTube automatically, finds the video file embedded in the page, and extracts it for conversion. Unfortunately, it seem to only work on YouTube; it doesn’t seem to be capable of extracting FLV files from other video sites. In addition to being able to convert FLV files to iPod video (giving you four options for the quality of the output video), it can also convert your FLV files to three quality levels of PSP video, three quality levels of mobile phone-compatible mp4 video and four different quality levels of mp3 audio. The only issue I’ve come across in the software so far (and some people may consider this a pro for the software as opposed to a con), is that it doesn’t throw any errors out if it it fails to download the entire FLV file from YouTube. Instead, the progress indicator jumps from wherever it encountered the problem straight to 100%, and the utility tells you that it’s done converting the video. Sometimes you get the whole video, other times you only end up with a few seconds of video before it cuts off. You can download the utility for free and view a tutorial explaining how to use the software from the main project Web site. If you have a digital media player, a PSP or a video-capable mobile phone, you should definitely get ahold of this application.